I was using the Facebook app when it decided to freeze. Out of frustration, I clicked the home button multiple times. I got back to the homescreen with VoiceOver turned on ('Triple-click Home' was not set) and a second later, Siri loaded. 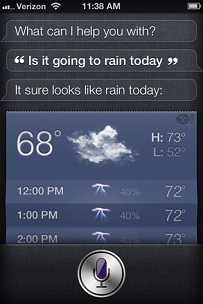 I tried to take a screenshot, but Siri closed just before the 'flash' took place. Has anyone else experienced this? Non-jail broken, iOS 5.0 on Verizon. So, unfortunately, any useful information contained in the crash logs has been lost. Was it Siri or was it Voice Control? 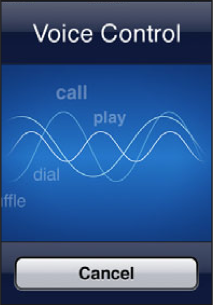 Voice Control has been on iPhone since iOS3. Siri on the left,Voice Control on the right. You activate Voice Control by holding the Home button for a few seconds, even while the phone is locked. Attach your iPhone to a Mac, If you have access, and see if you can get at the crash logs or the device console. Like others, I'm curious to know more about this. If you can see the crash logs via Xcode or something, you might be able to see more about this. Otherwise, it's a bug which you can't reproduce. Oh well. Being as siri is part of the OS, it's entirely possible that it loaded, then crashed because of missing files or whatever. Not the answer you're looking for? Browse other questions tagged iphone ios siri voiceover . How to disable Location Services using Siri?